Inspire your made-to-measure customers with the modern and comfortable way of taking measurements without tape measure. You save the cost and space requirements of a body scanner. With the ProfileFitPattern Suite you are able to determine the body measurements of your specific customers with two digital photos. This opens completely new possibilities in the market of individualised clothing as you do not have to summon the customer for measuring or rely on measurements taken by the customer. PFP Suite thus allows you to professionally determine customers‘ body measurements, world-wide, without the need for complex arrangements. In future, simply take photographs of your customer in front and side view to obtain all body measurements required for pattern development. These photos can be generated by the customer, for example for made-tomeasure orders from an online shop. With PFP Photo you correct the lens-distortion, rectify the perspective, scale the photos to a scale of 1:1 and align the image. 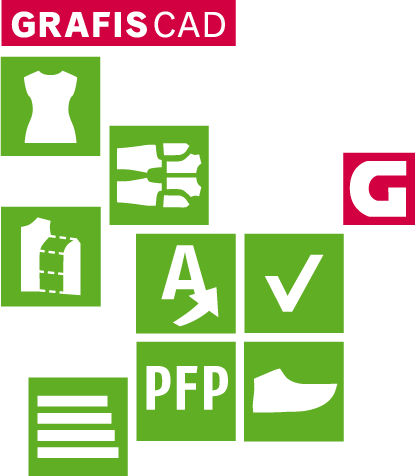 The images are used in GRAFIS CAD as a template for a profile construction with which the silhouette of front and side view are interactively reconstructed. GRAFIS determines the length, width and circumference body measurements from this profile. These can be used as a measurement chart for style development, enabling you to realise existing styles directly for individual customers. Depending on your experience, you will have extracted the customer’s measurements in approx. 15 minutes including processing in PFP Photo and adjusting the profile. Furthermore, you will already be familiar with the posture and the figure-specific characteristics of your customer through the photos. This knowledge can be instantly incorporated into the style development. Through incorporation of the images into the style file, you have your customer in front of you at all times. The programme ProfileFitPattern Photo is part of the ProfileFitPattern Suite and can also be used for digitising photographed pattern pieces.